In a previous post, I mentioned that I was invited to be part of Hampton by Hilton’s Ultimate Seekender Team. Our experience caused me to reflect on the distinct advantages of a hotel stay when visiting adult kids. With the holiday season approaching, many empty nesters may have plans to visit out-of-town adult “kids” who have grown up and flown the nest. Of course, waking up together under one roof on Christmas morning invokes a hefty dose of nostalgia and good cheer. But staying with relatives—even priceless children and/or grandchildren—for any extended length of time (let’s say more than three days) can get dicey. When we visited our son who had recently moved to the Silicon Valley from Manhattan, we took the pressure off him (and us) by breaking up our weeklong visit with a weekend stay at a nearby Hampton by Hilton. Yes, there can be too much of a good thing. If you are used to the solitude and quiet of an empty nest and like to stick to your own wake/sleep schedule instead of someone else’s, your hotel room will be an oasis: a place to recharge for the next family get-together or outing. Our king-bedded room at the end of the second floor at the Hampton by Hilton Milpitas was extremely quiet and peaceful. In fact, we never heard another guest during our three-night stay and were only woken up by our cell phone alarms. A nice bonus: There was an indoor gym and outdoor pool to work off the extra calories we consumed, and to soak in a bit of early morning California sunshine. When it comes to a hotel stay, isn’t it really all about the bed and getting a good night’s sleep? Why face the choice of either displacing someone or worrying about enduring a night of interrupted sleep? Our Hampton bed® was white, fluffy and uber-comfortable. 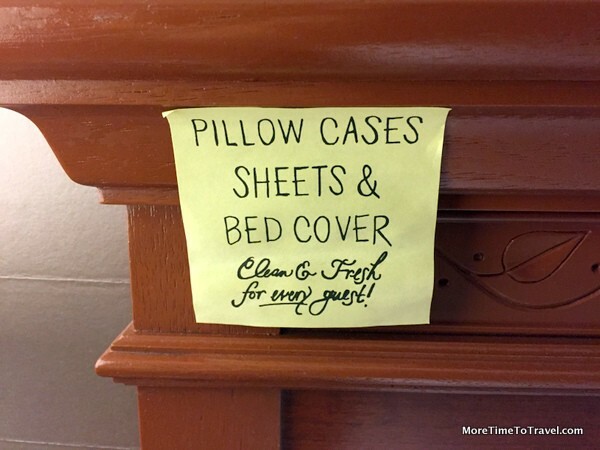 On our headboard, a sticky note let us know that the coverlets were washed for every guest. With a portfolio of more than 2000 properties, you’re likely to find a Hampton by Hilton that’s conveniently close to wherever you visit. In the Silicon Valley area alone, we actually had a choice of several properties, all within 20 minutes of our son’s apartment. Of course, we liked the reliability of knowing exactly what to expect in terms of the guest room standards at any of these properties. As Hilton Honors members, we took advantage of digital check-in and room selection (available across the entire family of Hilton properties) so we could pick the room we wanted from a floor plan on the day before check-in. Any change in routine can be stressful. Adult kids have lives of their own, which don’t necessarily stop just because you are visiting. Although they may not admit it to you, it can be just as nice for them to get you out of their hair as it is for you to have an exit strategy. In fact, it will make the time you do spend together all the more rewarding. Travelers want value and we never felt nickel-and-dimed at the Hampton property—all the properties are moderately priced and eminently affordable, especially on weekends when the business crowd is gone. The Wi-Fi was free to Hilton Honors members (which is free to join) so we were always connected. Breakfast, snacks and water bottles were also complimentary. We had gotten so comfy in our “home away from home” that it was sad when we realized our stay was over and it was time to say goodbye, pack our bags and head back East. I’m with you. While it is nice to be all together, there is such a thing as too much togetherness. It’s very hard to be a guest in someone else’s home, even if that “someone else” is your very own child. Sounds like you found a great place to stay! And I presume it feels that way on both sides of the equation! We tried staying with the kids once when they first got a house- and they’ve tried staying with us. We all agree that it’s a better visit in separate quarters. And if we vacation together, we get separate places as well and get two cars. Two cars definitely gives added mobility (and room for more). Staying at a hotel almost necessitates a rental car. I agree with the Ben Franklin adage too, although living so far away from my Mum (Australia to England) I tend to go for long chunks of time, and poor Mum, just has to put up with me 😉 I think as we get older, it becomes more important to be under one roof, but you’re right with our children who have recently flown the nest, a healthy dose of aloneness is a good idea. Our son’s place in Denver is much too small and I agree that keeping our own space makes our visits much more restful. Plus, our grandson loves the novelty of staying in a hotel and taking advantage of the pool! Yes, the pool can be a nice amenity for entertaining grandchildren! I LOVE the Happy Kits! Totally forgot about the benefits of sleeping in a hotel bed…can be MUCH better than a relative’s pull-out couch! Sometimes I wish I could stay in a hotel rather than a friend’s place, but that would insult them! I loved the Hampton by HIlton Happy Kits, too! We currently live just 1 hour from our son and daughter-in-law but when we lived on opposite coasts, and we’d fly east to visit, we always stayed in a hotel. Adult kids need their space – so do their parents! I like the concept of take your parents to work day. Take Your Parents to Work Day was such fun! Hope we can do it again. When we don’t stay with our adult children it is better for everyone! We all need our space and so do they! Hampton by Hilton seems to very thoughtful and goes beyond what is customary. I love know that my bed is so CLEAN! I was also very impressed with your bag to go. How thoughtful and helpful! Agree on all points. We have tried staying with the kids and it hasn’t been a disaster, but much prefer having a space to unwind and have our own time. Especially if it’s for an extended period of time. Our travel blogger son is somewhat annoyed that we have purchased a downsizing condo without a dedicated guest room like he has now for visits home. I suspect we’ll end up springing for a hotel room for him as he’s not a futon kind of guy anymore or so he tells us. A hotel room is less expensive that a year’s rental or maintenance fees for extra square footage you don’t really need! Hmmm…is there a tactful way to send this to my parents 🙂 I downsized to 800 square feet last year, and somehow my couch is still acceptable….